Did the US Government Make a Pact With Aliens to Get Technology? Phil Schneider was vocal before his death about what he says he learned about aliens while working under a high-level security clearance for the U.S. government. Epoch Times does not make any claims as to the veracity of his story, but rather presents his extraordinary claims for the reader’s entertainment and contemplation. Schneider met with ridicule from many, but there are also many who believe him after watching his videos, such as Veterans Today senior editor Gordon Duff who calls him a “UFO whistleblower.” Schneider was found dead in his apartment in 1996. Though it was ruled a suicide, some believe he was murdered. In 1954, then-President Dwight Eisenhower made a pact with three species of aliens, said Schneider in a lecture at the 1995 Preparedness Expo. 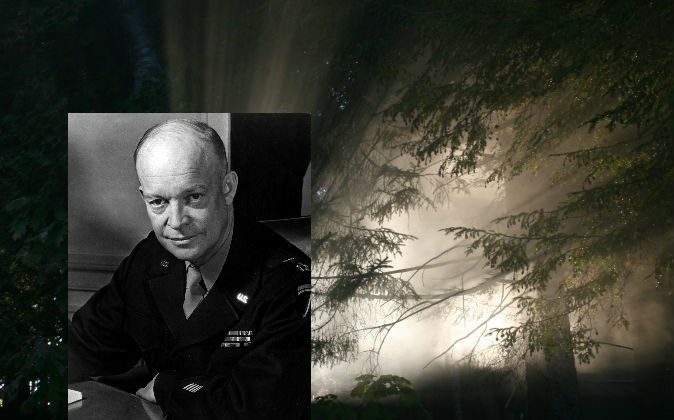 In exchange for alien technology, Eisenhower allegedly gave aliens permission to abduct some cattle and a limited number of human beings (added June 9: Schneider said the human abductees were for aliens to test implanting techniques and the aliens must give the details of the people involved). For decades livestock have been found inexplicably mutilated across the United States. More than 10,000 attacks have been recorded throughout the country, according to KLAS-TV Las Vegas. Some say these mutilations are done by cultists. Some say it’s predatory animals, although livestock have been found with their organs removed in a precise manner. Some say it’s aliens. The technology aliens gave to uphold their end of this exchange includes a kind of metal that is nearly indestructible. Schneider showed the audience what he said was a piece of this metal. It is made of niobium, an element we have on the periodic table, and marinite, an alien element you won’t find mentioned in Earth’s textbooks. He said the government also developed a spy satellite with the help of aliens that could spot a dime on your kitchen floor. It used infrared technology and had a resolution factor of 99.99961. The aliens violated the pact, said Schneider, by taking more humans than agreed upon. A war with the aliens has been fought ever since. He said the aliens plan to take over Earth by 2029 and he called on the government to tell citizens what it knows. Was there a battle between Special Forces and aliens that left more than 60 men dead in 1979?